with a focus on crash reconstruction, crash test research and impact biomechanics. Historically, assumptions have been made concerning the performance of passenger car bumpers because they are designed to meet certain Federal standards. When vehicles were designed with energy absorbing pistons, calculations could be made concerning the collision energy by measuring the compression of the pistons. In most cases, no damage to the struck vehicle meant the collision magnitude was small enough to fall within the performance standards of a 2.5 mph or 5.0 mph bumper standard. Thus, the collision was not of a magnitude to cause occupants harm. Today, automotive designers have moved away from energy absorbing pistons. The use of Styrofoam or plastic honeycombs beneath the decorative bumper cover is now common. These materials are proving to be excellent energy absorbers. In some cases, they may withstand impacts greater than 5.0 mph without signs of residual damage. Sometimes, the result is a delta V for occupants of the struck vehicle may exceed the symptom/injury threshold discussed in the biomechanical data. 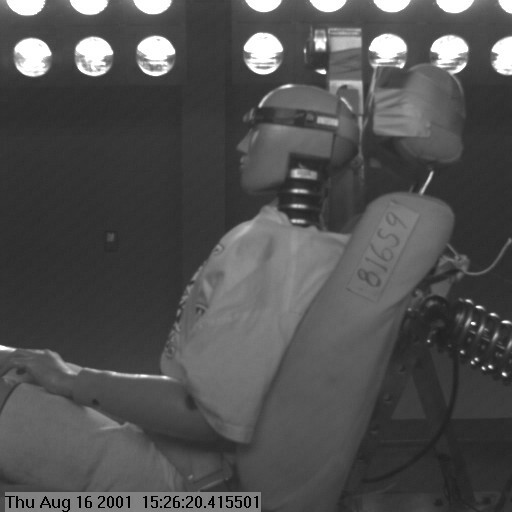 This point was illustrated in a series of 15 crash tests we performed, in conjunction with Biomechanical Research and Testing at our Transportation Technology Center the week of July 21, 1997. We select a 1989 Toyota Corolla SR5 equipped with a Styrofoam bumper and a 1990 Pontiac LeMans equipped with a plastic honeycomb bumper. Both vehicles were manufactured to conform to Federal standards requiring them to pass a 2.5 mph barrier test. The test vehicles weighted approximately the same. The objective of the test was to determine the speeds and delta V when damage would begin to occur on either vehicle. The Toyota was driven into the rear of the LeMans at speeds of 31. mph, 5.3 mph and 9.3 mph. The velocity change of the LeMans was 2.2 mph, 3.8 mph and slightly over 6.0 mph. In each test, there was no visible damage to either vehicle. Additionally a female volunteer was instrumented and occupied the LeMans during the tests. All test subjects were evaluated by a chiropractor before the tests and twenty-four hours after. The volunteer reported some muscle soreness and her range of motion was slightly decreased at the twenty-four hour mark. By the 4th day following the tests, she was completely symptom free. Test three was clearly a case where a 6.0 mph delta V was exceeded, some muscle soreness occurred. In a subsequent test, we wanted to see just how fast one would have to travel to cause visible damage to either vehicle. We aligned the Toyota and Lemans front to rear and conducted a test where the impact speed for the Toyota was about 23 mph. Both cars were instrumented and a volunteer was used only in the bullet vehicle. The collision resulted in heavy compression damage along the rear of the LeMans, but NO visible damage, other than a few scuff marks, on the Toyota. Finally, we struck the Toyota into the side of a Pontiac T1000 at 28 mph. The result was massive damage on the right side of the T1000 and fairly severe compression damage on the front of the Toyota. Both of these high velocity tests resulted in a bullet car delta V of about 14 mph. The bullet car volunteer experienced no soreness in the cervical, thoracic or lumbar area, post collision. The only symptom noted was a slightly stiff left ankle the morning after the collision testing. What does all of the data mean? For starters, the tests seem to validate our position that a delta V of less than 6.0 mph for rear collisions or less than 10 mph for frontal collisions is a good criterion for discussing the symptom/injury threshold. More importantly, it clearly illustrates that a vehicle to vehicle collision resulting in no damage does no automatically mean that the occupant of a struck vehicle would not suffer some symptom associated with injury. The best recommendation is to look at each collision independently and avoid trying to use a blanket analogy for collisions showing no damage.